The Turtles are vacationing in the Alps, as Splinter goes off to a nearby mountain to meditate. April is in an Alpine village with Irma when she notices the ice and snow melting, unusual for this time of year. We soon learn that Krang has sent Shredder to the village with a Zoetropic wave device to melt the worlds’ ice, flooding the coastal cities and making Earth easy prey. When April discovers this, Shredder sends Rocksteady and Bebop to kidnap her. She is able to leave a clue for the Turtles to find before she is captured. Irma’s new boyfriend, handsome Gustav, helps the Turtles — until he turns out to be a robot of Shredder’s, sent to stop the Turtles from locating Shredder’s mountaintop hideout. 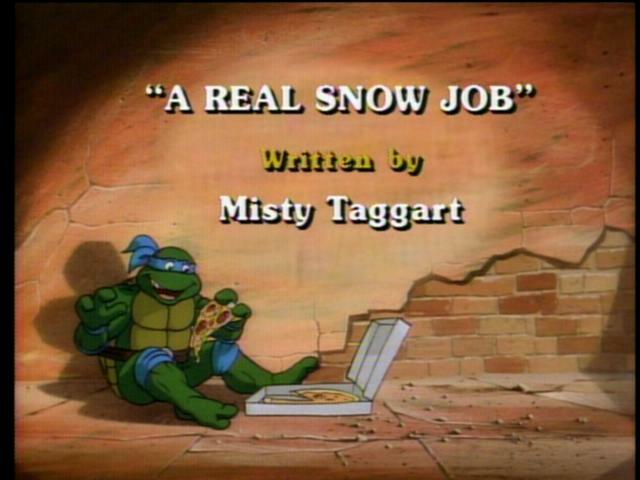 The Turtles arrive and stop Shredder just as the gigantic glacier is about to crush the town. Donatello manages to reverse the temperature drop, and things return to normal.